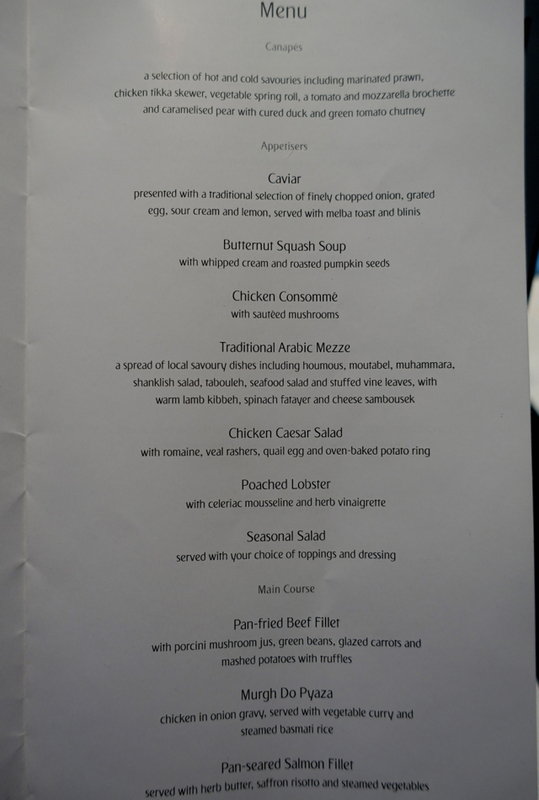 This Emirates First Class A380 review of a New York JFK to Dubai flight is part of a new trip report featuring Qantas First Class on the A380 to Melbourne, Etihad First Apartment on the A380, and stays and fine dining in some of New Zealand's best luxury lodges and in Sydney, Australia. 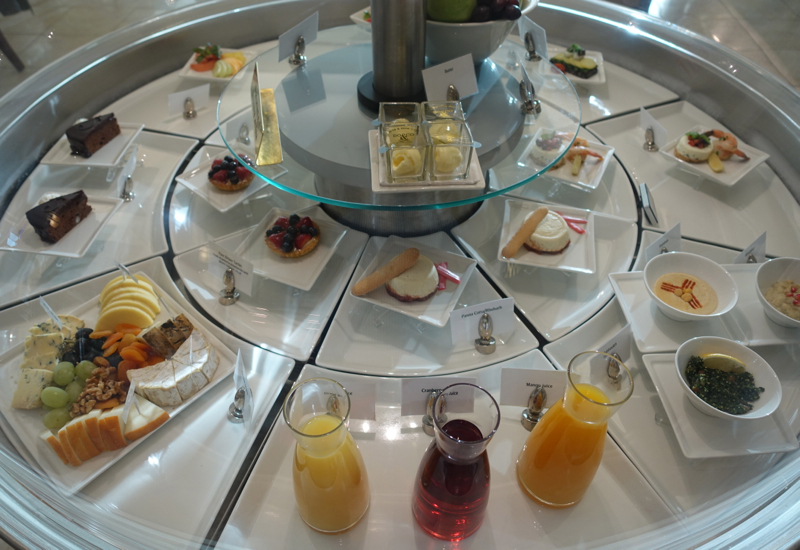 There are times when a First Class lounge seems like a frivolous necessity. 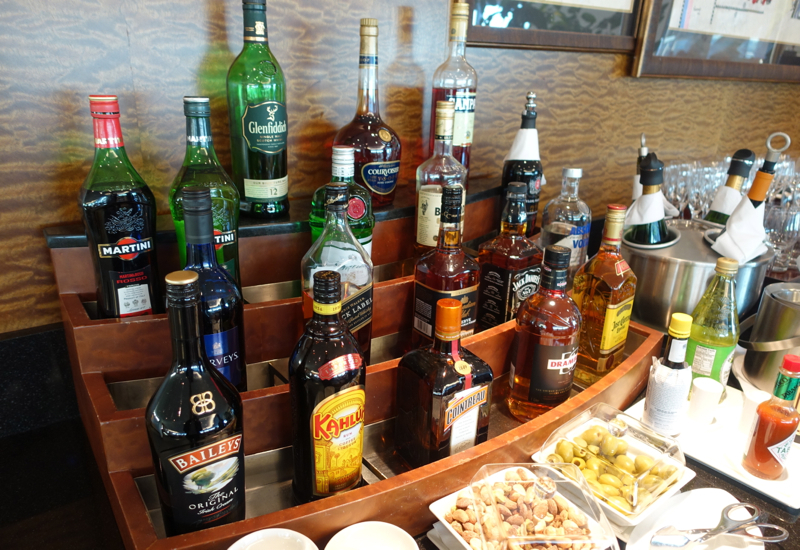 And then there are times, such as my recent trip to New Zealand, when a lounge can really help to start a vacation properly. 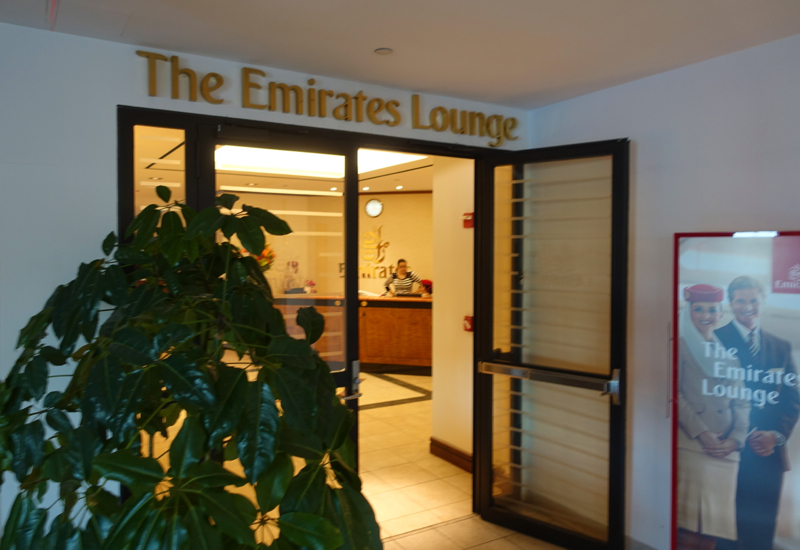 I had needed to skip lunch in order to make it to JFK on time, and so I was very pleased to enter the Emirates lounge at JFK Terminal 4 and still have time for a sit-down meal. 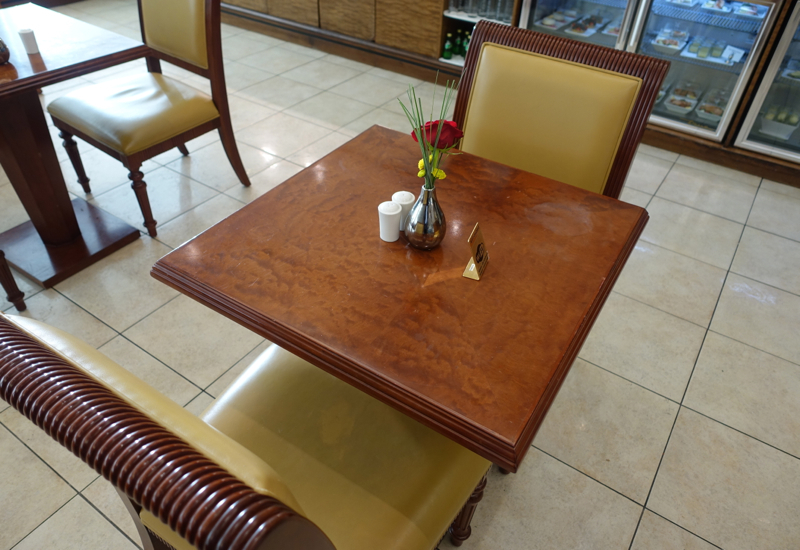 There was ample lounge seating, but I sat down in the dining room area. I enjoyed my meal of tender veal, dauphine potatoes, stuffed roasted tomatoes, and provencale crab cakes with lemon aioli. 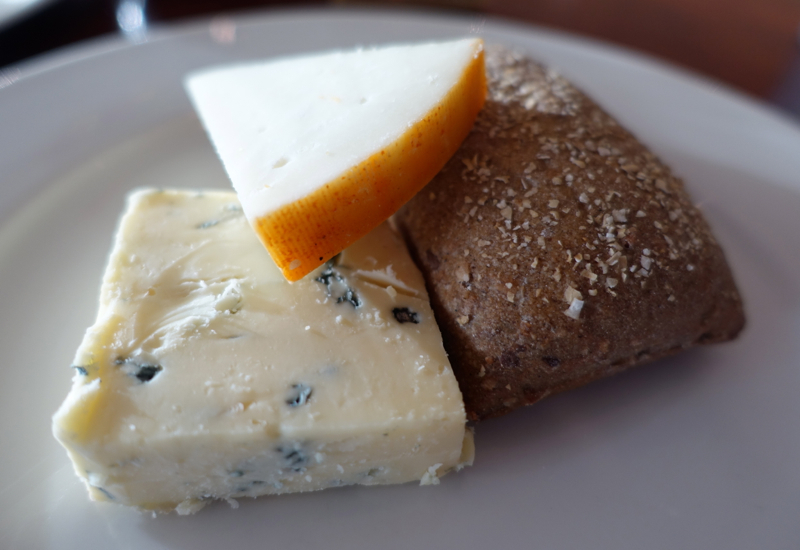 I followed this with some bread and cheese. 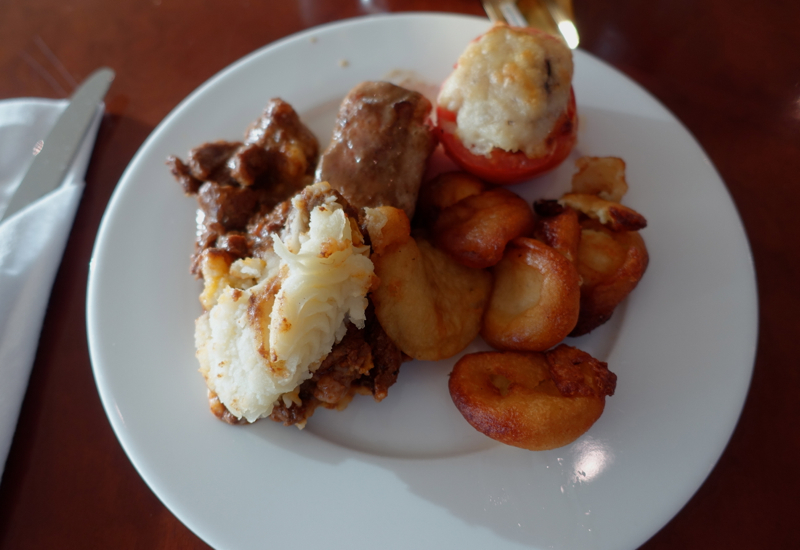 The food was excellent, and the service was prompt and friendly, and the experience put me in a great mood for a much-anticipated vacation. 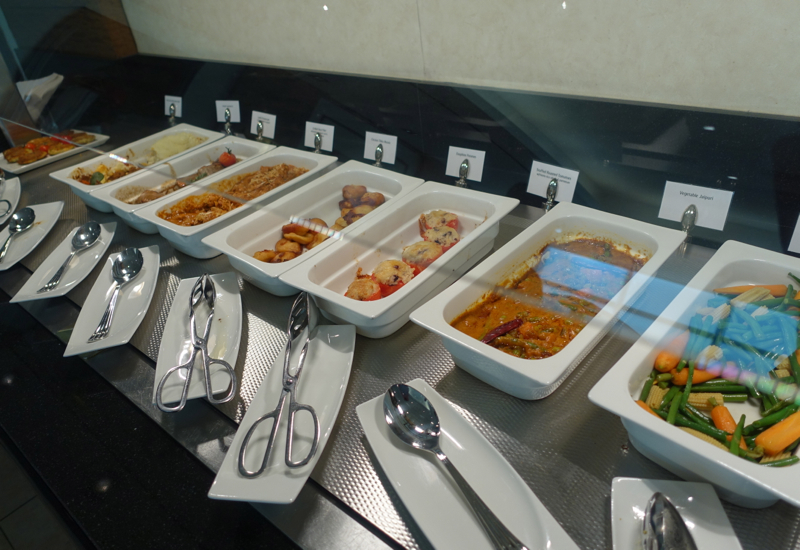 There was a broad selection of curries, which also looked delicious, but my plane was boarding. 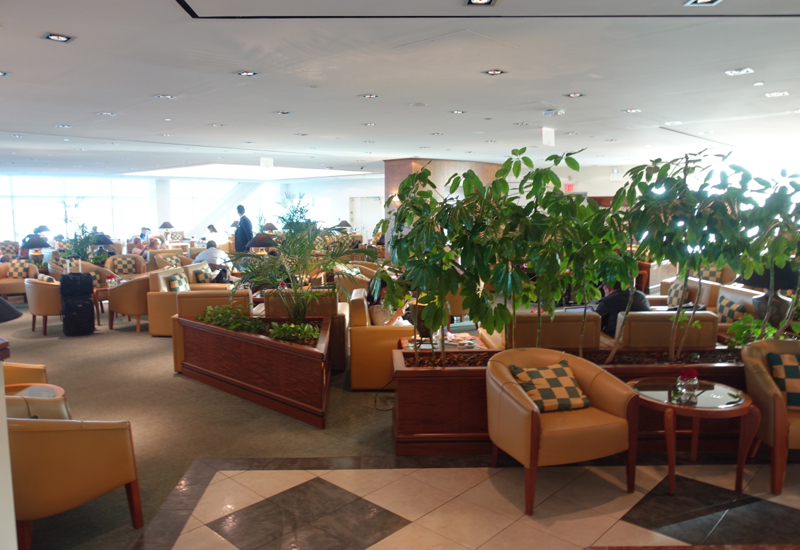 I could board to my First Class seat directly from the lounge, which is always a welcome benefit. 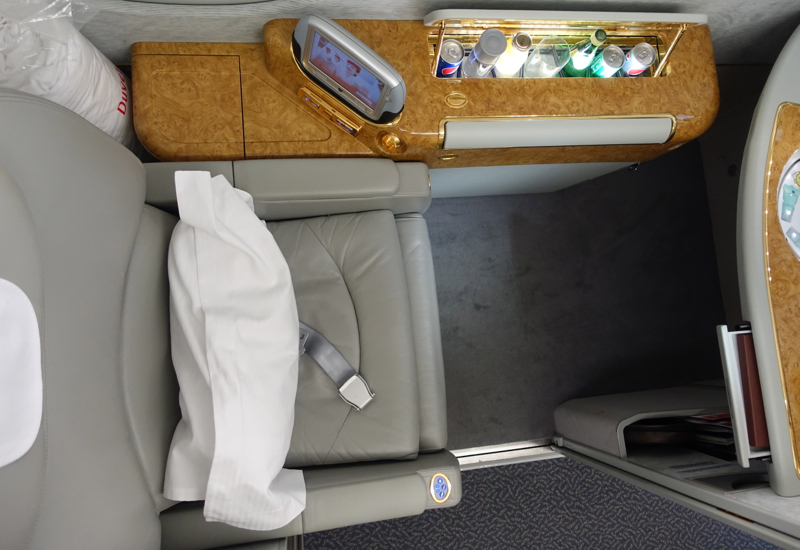 The Emirates A380 First Class Cabin is at the front of the upper deck, with 14 closed suites in a 1-2-1 configuration, three of them in the middle as paired couple's seats (although the divider can be raised for solo travelers). If you are traveling solo, as I was, I'd recommend 2A or 3A window seats on the left, or 2K or 3K window seats on the right. I'd avoid the first row and the last row (1A, 1K, 4A and 4K) so as to avoid being disturbed by light from the galley or lavatory. 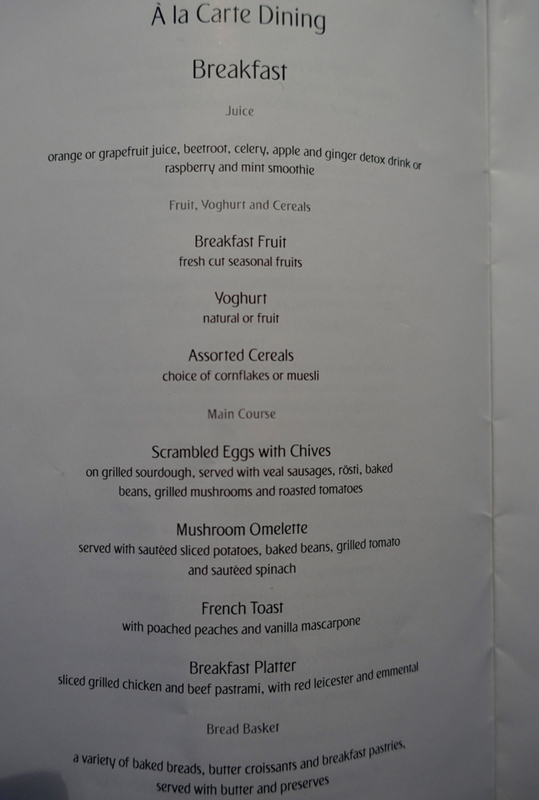 I took the pre-flight drink of Dom Perignon champagne, and then later the pre-flight snack of dates and Arabic coffee. The seat itself remains tackily extravagant, with a vanity mirror, bowl of various junk food snacks such as a Mars bar, potato chips and shortbread cookies (it reminds me of what you might collect if you went trick-or-treating), and three different lights, including an odd-looking desk lamp. I suppose the seat décor might go over well with the “Real Housewives of Beverly Hills,” but at least to me it seems decidedly goofy. That being said, the seat itself is large and rather comfortable, and I especially like that the headrest can be raised to accommodate someone much taller than me (and I am 6’5”). 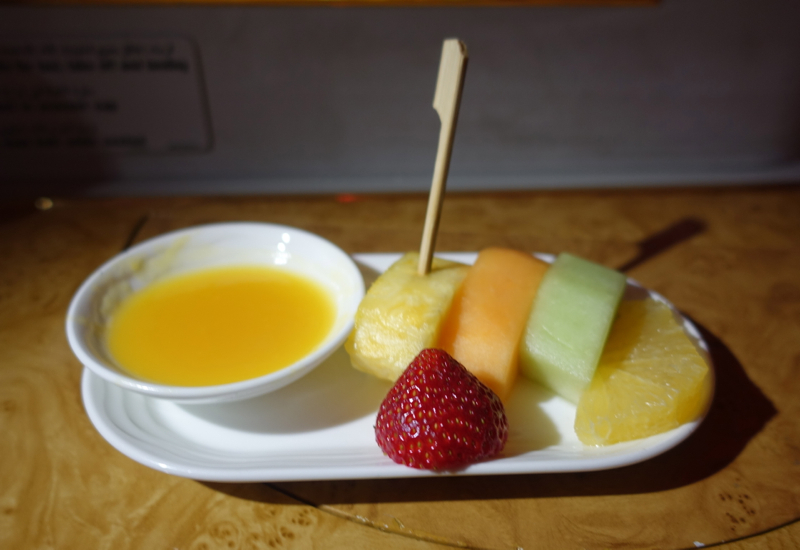 I took my shower before my dinner and before going to sleep, so when I returned to my seat from the bathroom I found a small fruit plate waiting for me, which was a nice refresher. 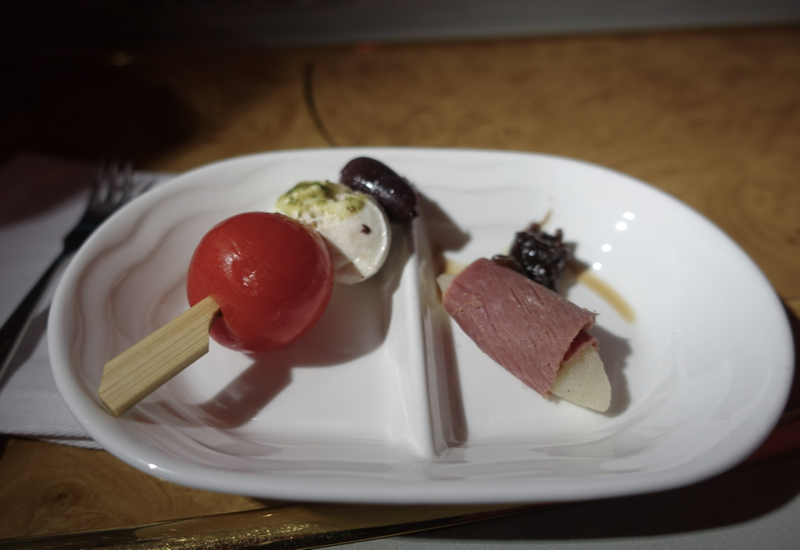 I then had an amuse bouche of turkey, tomato, cheese and olive, which were straightforward and tasty. 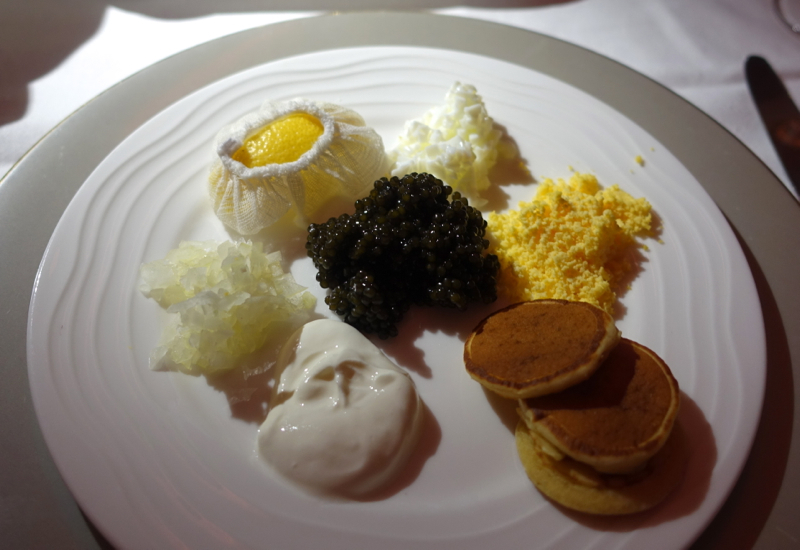 I then selected as an appetizer the caviar service, which was very bland and disappointing, compared to the caviar on other flights, including my prior Emirates flight. 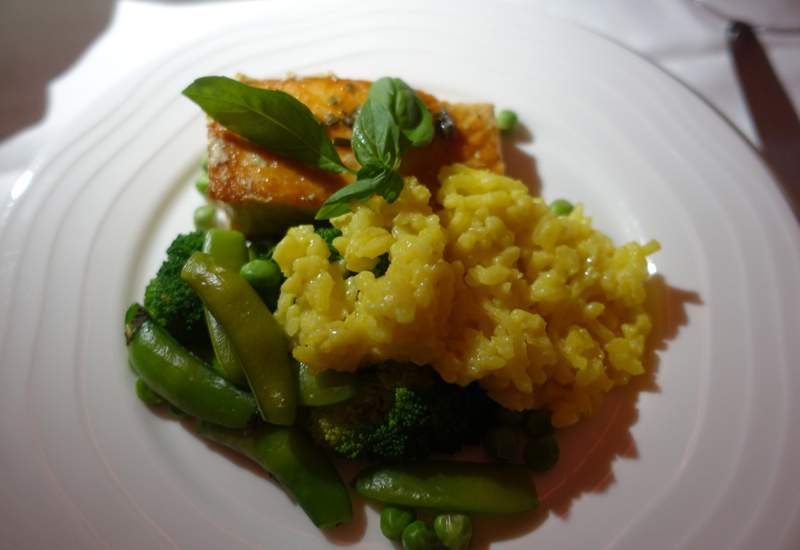 For my main course I had the pan-seared salmon fillet with saffron risotto and steamed vegetables. The salmon was quite good, and the vegetables were still flavorful and slightly crunchy. 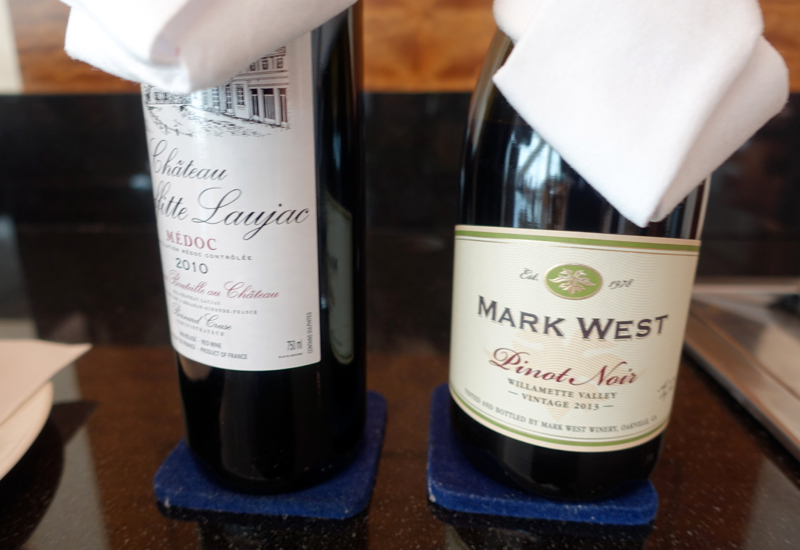 I chose a Bordeaux white wine, the Aile d’Argent, Chateau Mouton Rothschild 2010, which was excellent. 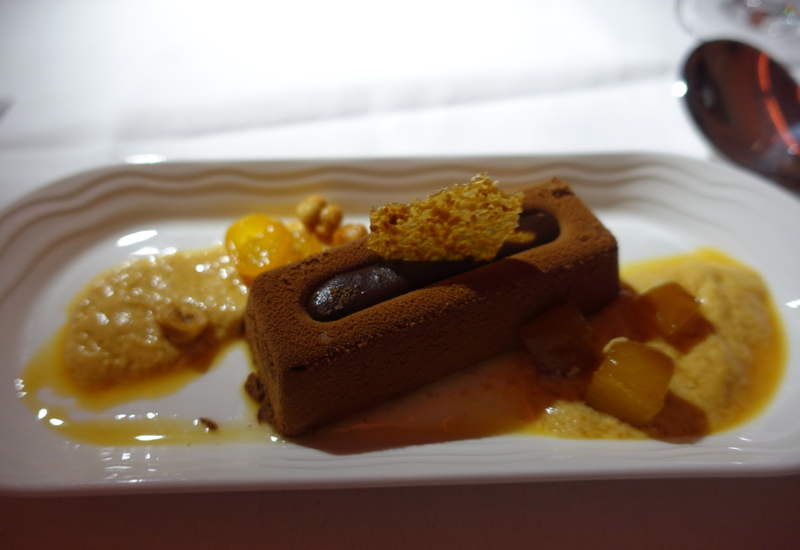 For dessert I chose the Chocolate and Caramel Torte with kumquat compote and nut brittle. 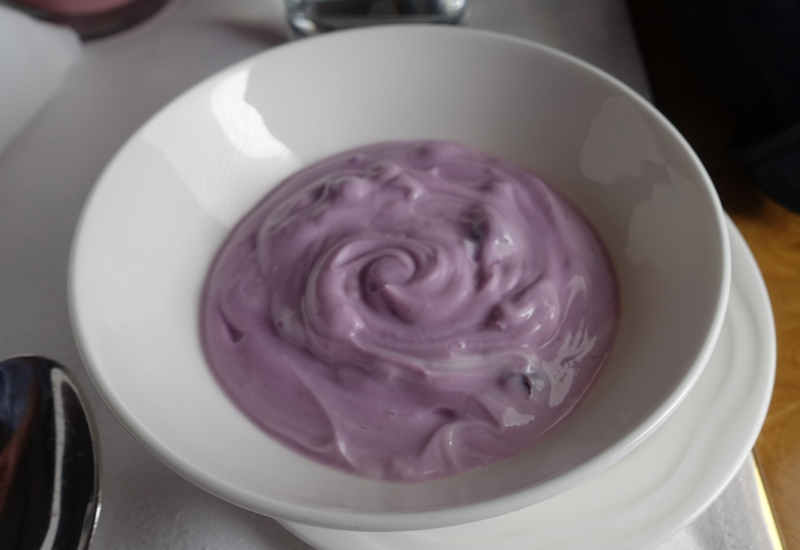 This was similar to a fluffy chocolate mousse, and the kumquat compote was quite similar to apple compote in taste and texture, with the nut brittle a welcome textural contrast. 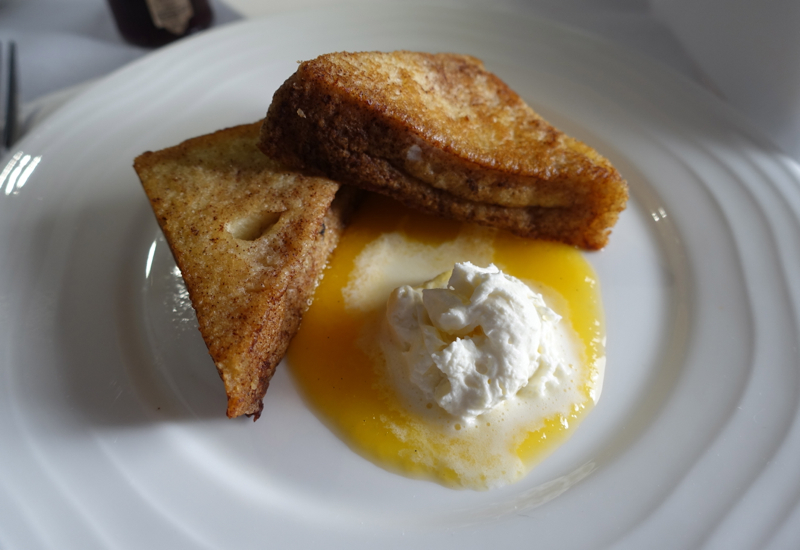 Upon waking from my sleep, I had a raspberry mint smoothie which was very good, and ordered the French toast, which was mediocre, except for the peach sauce and vanilla mascarpone. 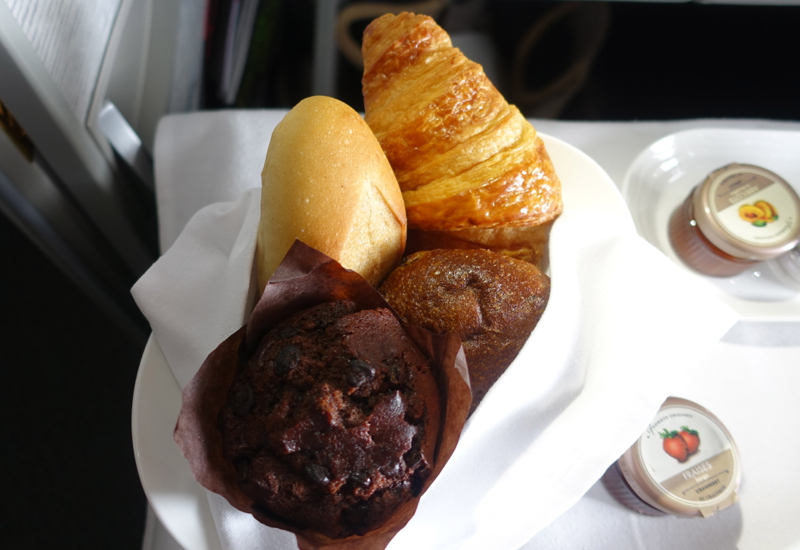 That said, the mint tea, blueberry yogurt, croissant and chocolate muffin were all rather yummy. 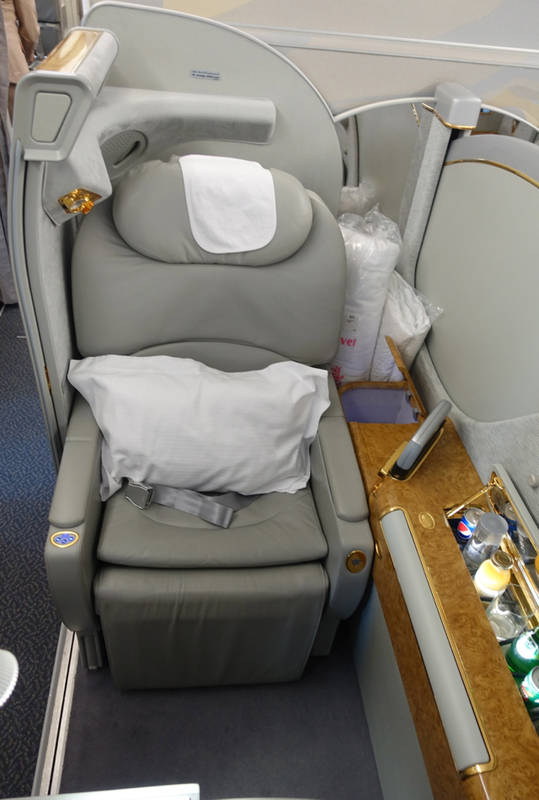 The bed is certainly large enough, but I really have a hard time understanding why, with such frivolous amenities as the basket of junk food, and pop-up vanity mirror, Emirates is unable to provide some type of foam topper or other soft layer that would make sleep more comfortable. My sleep quality was rather poor, as I tossed and turned trying to get comfortable on the too-hard flatbed. Also, the seat headrest remains at a slight incline, and the pillow provided for sleep is not very large, so my head position seemed always at a slightly uncomfortable angle. This could have been remedied with a better pillow. 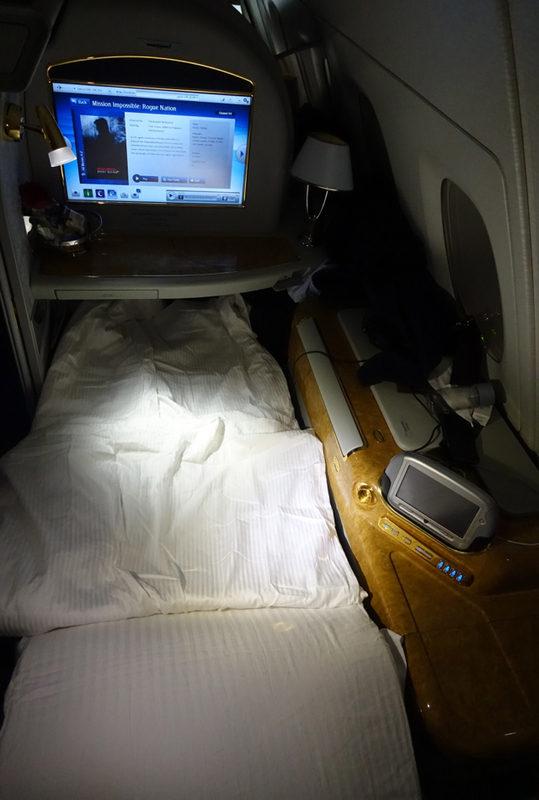 Certainly, the First Class bed is not at the same level of quality as Singapore Suites or the Etihad Cabin. 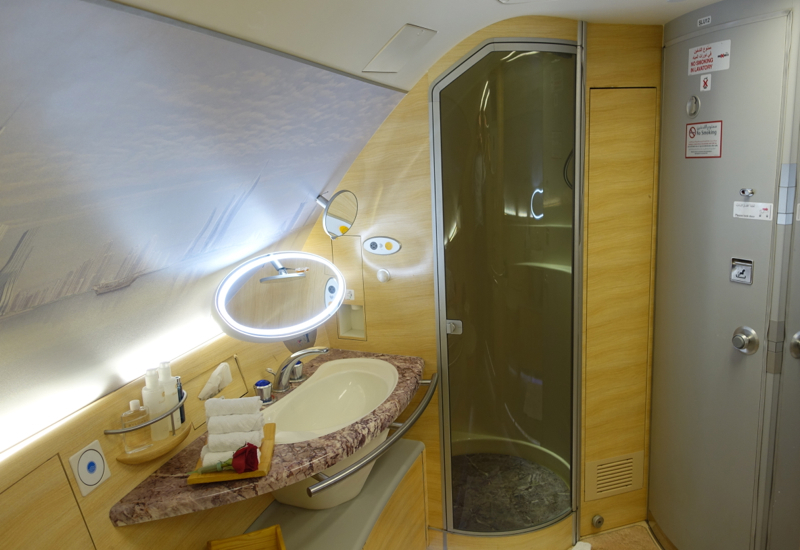 Without a doubt, the Emirates shower and bathroom is the best part of the onboard Emirates experience. The room is so spacious, the floor is warmed, the lighting is soft but not too dark, and there are handy spaces and amenities exactly where you need them. 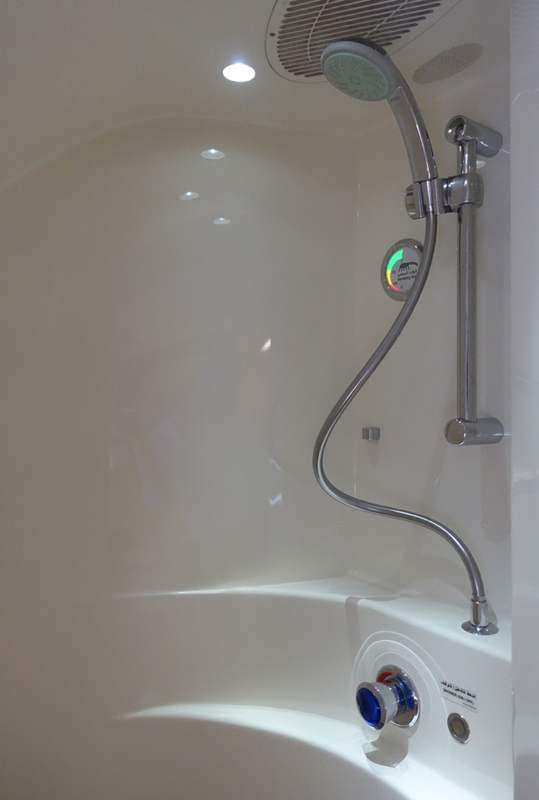 The flight attendants are very helpful in preparing the shower, and in making sure you have what you need. The water pressure is decent, and you have 5 minutes, shown via a dial that goes from green to yellow to red. There is a hair dryer, a decorative floral arrangement, enough towels, everything you need to have a lovely experience. And if you don't care for the Timeless Spa bath products, there are also some Bulgari toiletries in the amenity kit, as well as Bulgari perfume. 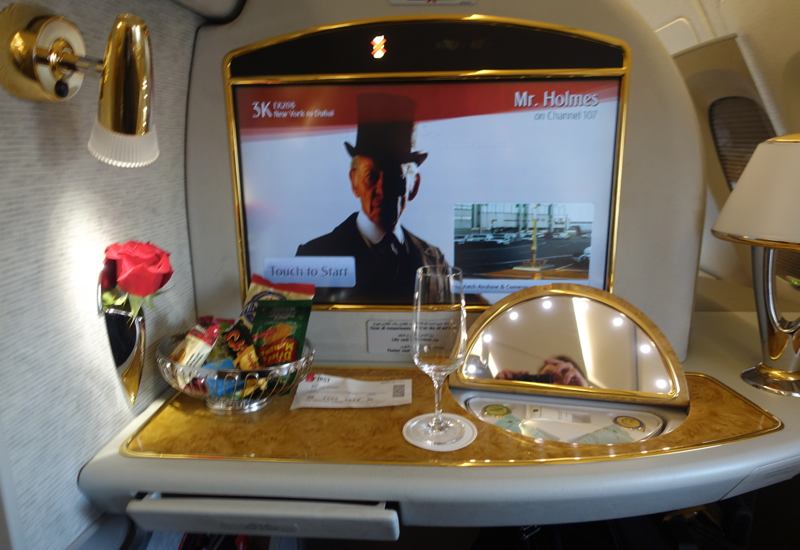 As always, Emirates has among the best variety of in-flight films, offering films in various African languages, Arabic, English, various European languages, Hindi, Japanese, Korean, Malay, Mandarin, and Russian, among others. I couldn’t resist watching the new Mission Impossible: Rogue Nation film, which I loved, but which my wife would later describe as “too far-fetched.” Well, after all, it is Mission Impossible, not Mission Realistically Achievable. I will say that I was once again flummoxed by the entertainment system, which utilizes a touch screen, an iPad-like device, and a remote console. I can never figure out how to properly use the devices to control the system, leaving me with the touch-screen option, but the screen is a difficult stretch, especially if you are lying down or buckled in. But this minor annoyance is probably the result of my being not very skilled in using such devices—a younger person would probably have no problems. Although the First Class cabin was not very full, I have to say that the service was not quite up to speed. The staff was always friendly and courteous, but unlike Singapore or other airlines, the attendants were somewhat slow in providing requested services, were not that attentive, and in general missed the mark of providing top-quality service: they were more reactive and did not anticipate needed accommodations. 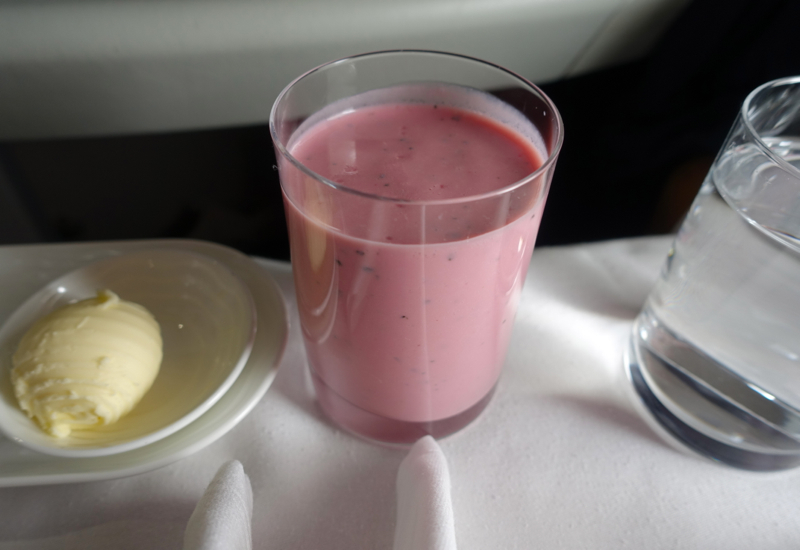 For example, after I woke from sleep, and headed to the bathroom to change out of my pajamas an hour prior to landing, most First Class attendants would have changed the bed back into a seat for the remainder of the flight. 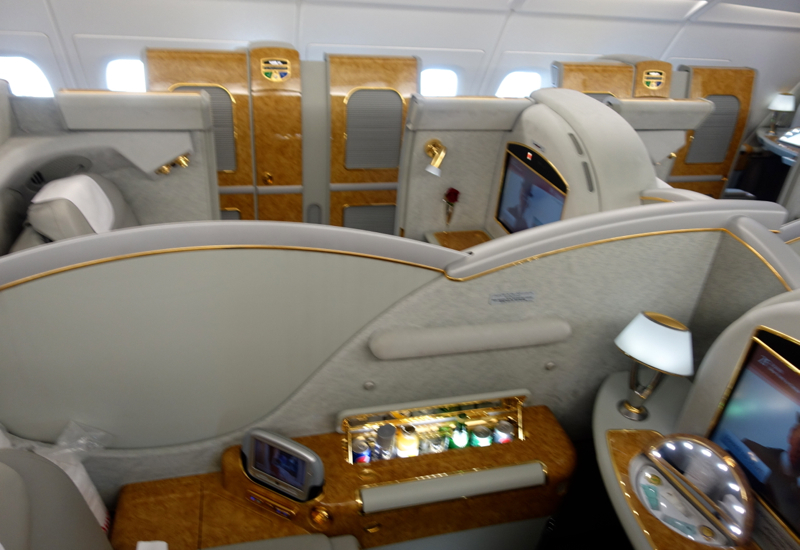 On this Emirates flight, I had to poke around to try to find a free attendant, and failing that, I did it myself. It’s not a big deal, but it does reflect on the quality of service. 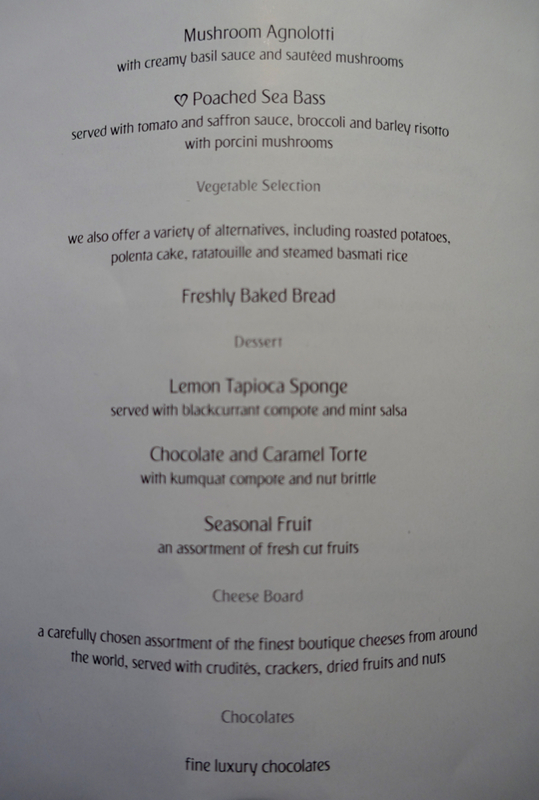 There were some very excellent aspects (the shower and film selection) and some not so excellent aspects (the seat and service). 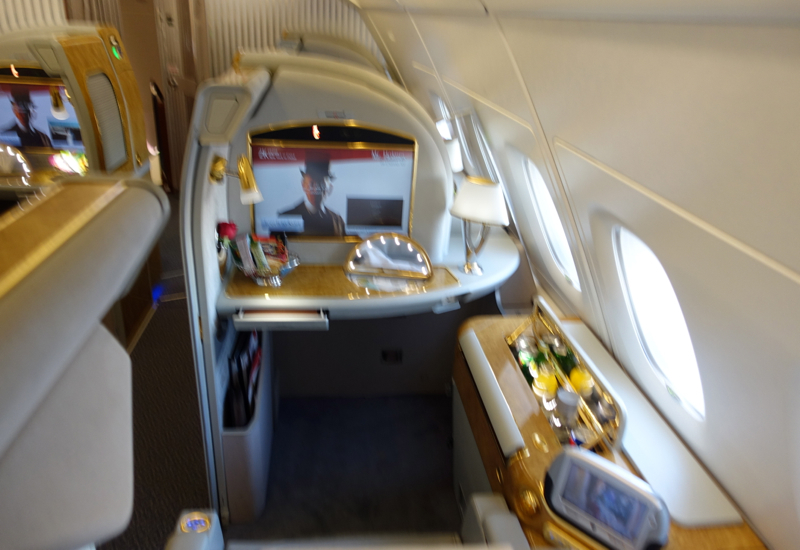 Although flying Emirates First Class is still a welcome luxury and treat, the overall quality of the experience is not comparable with other carriers, such as Singapore Suites or Etihad. 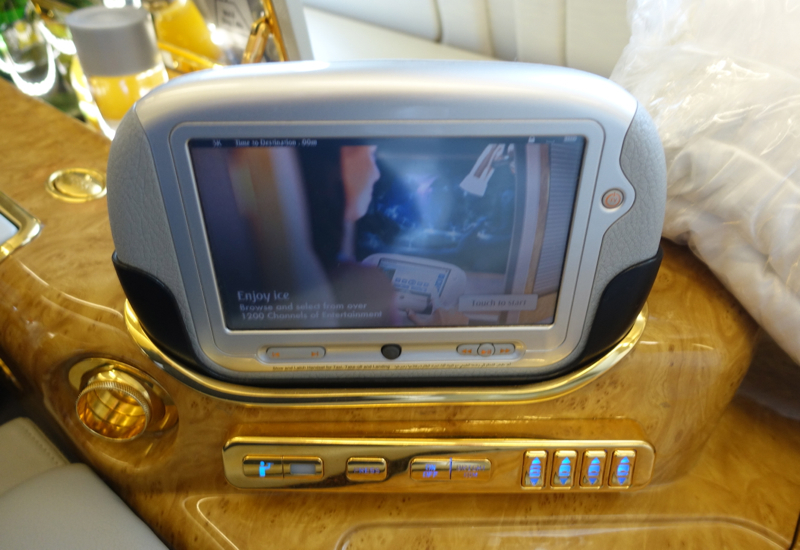 If you've flown Emirates First Class on the A380, what was your experience?